Mercer County is a county located in the U.S. state of New Jersey. Its county seat is Trenton, the state capital. The county is part of the Trenton, NJ Metropolitan Statistical Area and is considered part of the New York metropolitan area by the United States Census Bureau, but also directly borders the Philadelphia metropolitan area and is included within the Federal Communications Commission's Philadelphia Designated Market Area. As of the 2010 United States Census, the population was 366,513, an increase of 15,752 (4.5%) from the 350,761 enumerated in the 2000 Census, retaining its position as the 12th-most populous county in the state. Mercer County stands among the highest-income counties in the United States, with the Bureau of Economic Analysis having ranked the county as having the 78th-highest per capita income of all 3,113 counties in the United States (and the sixth-highest in New Jersey) as of 2009. The county was formed by an Act of the New Jersey Legislature on February 22, 1838, from portions of Burlington County (including Nottingham Township), Hunterdon County (including Ewing Township, Lawrence Township, Trenton City and portions of Hopewell Township), and Middlesex County (including West Windsor Township and portions of East Windsor Township). The old Keith Line bisects the county and is the boundary between municipalities that previously had been separated into West Jersey and East Jersey. It was named for Continental Army General Hugh Mercer, who died as a result of wounds received at the Battle of Princeton on JanuaryÂ 3, 1777. The Mercer Oak, against which the dying general rested as his men continued to fight, appears on the county seal and stood for 250 years until it collapsed in 2000. Mercer County is home to Princeton University, Princeton Theological Seminary, the Institute for Advanced Study, Rider University, The College of New Jersey, Thomas Edison State College and Mercer County Community College. Founded February 22, 1838, from portions of surrounding counties, Mercer County has a historical impact that reaches back to the pivotal battles of the American Revolutionary War. On the night of DecemberÂ 25â"26, 1776, General George Washington led American forces across the Delaware River to attack the Hessian barracks in Trenton on the morning of DecemberÂ 26. Following the battle, Washington crossed back to Pennsylvania. He crossed a third time in a surprise attack on the forces of General Charles Cornwallis at the Second Battle of Trenton on JanuaryÂ 2, 1777, and at the Battle of Princeton on JanuaryÂ 3. The successful attacks built morale among the pro-independence colonists. There were 27 Mercer County residents killed during the September 11, 2001 terrorist attacks in Lower Manhattan. A 10-foot (3.0Â m) long steel beam weighing one ton was given to the county by the Port Authority of New York and New Jersey in March 2011 and is now displayed at Mercer County Park. According to the 2010 Census, the county had a total area of 228.89 square miles (592.8Â km2), of which 224.56 square miles (581.6Â km2) of it (98.1%) was land and 4.33 square miles (11.2Â km2) of it (1.9%) was water. The county is generally flat and low-lying on the inner coastal plain with a few hills closer to the Delaware River. Baldpate Mountain, near Pennington, is the highest hill, at 480 feet (150Â m) above sea level. The lowest point is at sea level along the Delaware. At the 2010 United States Census, there were 366,513 people, 133,155 households, and 89,480 families residing in the county. The population density was 1,632.2 per square mile (630.2/km2). There were 143,169 housing units at an average density of 637.6 per square mile (246.2/km2). The racial makeup of the county was 61.39% (225,011) White, 20.28% (74,318) Black or African American, 0.33% (1,194) Native American, 8.94% (32,752) Asian, 0.08% (295) Pacific Islander, 6.24% (22,856) from other races, and 2.75% (10,087) from two or more races. Hispanics or Latinos of any race were 15.09% (55,318) of the population. There were 133,155 households, of which 31.4% had children under the age of 18 living with them, 48.2% were married couples living together, 14.2% had a female householder with no husband present, and 32.8% were non-families. 26.9% of all households were made up of individuals, and 10.1% had someone living alone who was 65 years of age or older. The average household size was 2.61 and the average family size was 3.16. In the county, 22.6% of the population were under the age of 18, 10.9% from 18 to 24, 26.9% from 25 to 44, 26.9% from 45 to 64, and 12.6% who were 65 years of age or older. The median age was 37.8 years. For every 100 females there were 95.5 males. For every 100 females age 18 and over, there were 93 males. As of the 2000 United States Census there were 350,761 people, 125,807 households, and 86,303 families residing in the county. The population density was 1,552 people per square mile (599/kmÂ²). There were 133,280 housing units at an average density of 590 per squareÂ mile (228/kmÂ²). The racial makeup of the county was 68.48% White, 19.81% Black or African American, 0.20% Native American, 4.94% Asian, 0.10% Pacific Islander, 4.29% from other races, and 2.17% from two or more races. 9.66% of the population were Hispanic or Latino of any race. Among those residents listing their ancestry, 15.4% of residents indicated that they were of Italian, 13.1% Irish, 11.8% German, 8.0% Polish and 8.0% English ancestry according to Census 2000. In the county the population was spread out with 24.00% under the age of 18, 10.20% from 18 to 24, 30.60% from 25 to 44, 22.50% from 45 to 64, and 12.60% who were 65 years of age or older. The median age was 36 years. For every 100 females there were 94.90 males. For every 100 females age 18 and over, there were 92.00 males. Mercer County has a county executive form of government, in which the County Executive performs executive functions, administering the operation of the county, and a Board of Chosen Freeholders acts in a legislative capacity. 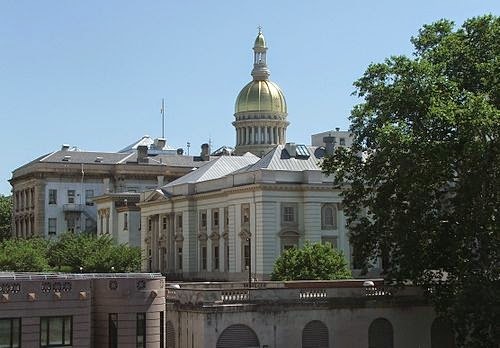 The seven-member Board of Chosen Freeholders is elected at-large to serve three-year staggered terms of office on a staggered basis, with either two or three seats up for election each year. The Board is led by a Freeholder Chair and Vice-Chair, selected from among its members at an annual reorganization meeting held in January. The Freeholder Board establishes policy and provides a check on the powers of the County Executive. The Board approves all county contracts and gives advice and consent to the County Executiveâs appointments of department heads, and appointments to boards and commissions. The Freeholder Board votes to approve the budget prepared by the Executive after review and modifications are made. Mercer County's constitutional officers are County Clerk Paula Sollami-Covello, Sheriff John A. "Jack" Kemler (D, 2017) and Surrogate Diane Gerofsky. The Mercer County Superior Court is located in Trenton, the county seat. Law enforcement on the county level is provided by the Mercer County Sheriff's Office and the Mercer County Prosecutor's Office. Portions of the 4th and 12th Congressional Districts cover the county. New Jersey's Fourth Congressional District is represented by Christopher Smith (R). New Jersey's Twelfth Congressional District is represented by Bonnie Watson Coleman (D, Ewing Township). The county is part of the 14th, 15th and 16th Districts in the New Jersey Legislature. Mercer County has county routes, state routes, U.S. Routes and Interstates that all pass through. As of 2010, the county had a total of 1,524.30 miles (2,453.12Â km) of roadways, of which 1,216.48 miles (1,957.73Â km) were maintained by the local municipality, 175.80 miles (282.92Â km) by Mercer County, 118.99 miles (191.50Â km) by the New Jersey Department of Transportation and 13.03 miles (20.97Â km) by the New Jersey Turnpike Authority. The state routes that pass through Mercer are Route 27 (only in Princeton), Route 29, Route 31, Route 33, Route 129, and Route 133. There are three US Routes that pass through Mercer County, which are: U.S. Route 1 (which bisects the county), U.S. Route 130 and U.S. Route 206. Mercer County houses a few limited access roads, such as Interstate 295, Interstate 195, and Interstate 95 (which is also designated along the New Jersey Turnpike). (Mercer is the only county in the state that hosts I-95 and both its auxiliary routes.) Two turnpike interchanges are located in Mercer: Exit 7A in Robbinsville and Exit 8 in East Windsor. Mercer County is where Interstate 95 abruptly ends at the interchange with US 1 and I-295 in Lawrence Township, and becomes I-295 south. Signs direct motorists to the continuation of I-95 by using I-295 to I-195 east to Interstate 95 / New Jersey Turnpike. This is all due in part to the cancellation of the Somerset Freeway that was supposed to go from Hopewell in Mercer County up to Franklin in Somerset County. The 95 shields on the "Trenton section" are to re-numbered as part of "I-195 Extension," when a direct interchange with Interstate 95 in Pennsylvania and Interstate 276 is built (which will not be until 2017). This planned interchange indirectly prompted another project: the New Jersey Turnpike Authority extended the 'dual-dual' configuration (inner car lanes and outer truck / bus / car lanes) to Interchange 6 in Mansfield Township, Burlington County from its former end at Interchange 8A in Monroe Township, Middlesex County. This widening was completed in early November of 2014. Mercer hosts several New Jersey Transit stations, including Trenton, Hamilton, and Princeton Junction on the Northeast Corridor Line. SEPTA provides rail service to Center City Philadelphia from Trenton and West Trenton. Long-distance transportation is provided by Amtrak train service along the Northeast Corridor through the Trenton Transit Center. NJTransit's River Line connects Trenton to Camden, with three stations in the county, all within Trenton city limits, at Cass Street, Hamilton Avenue and at the Trenton Transit Center. The following municipalities are located in Mercer County. The municipality type is listed in parentheses after the name, except where the type is included as part of the name. Census-designated places and other unincorporated communities are listed under their municipalities.